What is consciousness? Is it the “self”? Is it “me”? Basho argues no! You are in possession of the one of the universe’s most mysterious objects. Your personal copy of this object differs in function only slightly from all the other similar objects in our solar system. It is the part of you that feels pleasure and yet it is also the part of you that knows pain. It is a part of your body that you cannot see, but it is also that which you rely on to make sense of what you observe. It is built of more than 33 billion neurons, linked in a mesh up to 10 thousand times each, making a total number of connections greater than the observable stars in the sky. It is the true wonder of planet Earth; for it grew here in the same way apples grow on trees. And while we can explore the furthest reaches of light-enabled space, we cannot claim to have begun understanding this small lump of tissue we each possess. Our sciences regarding it are crude at best and mostly replying on mere observation. That sum of knowledge eventually comes down to this: which bits you should not poke. On the other hand, our mental science experts, doctors and scientists try to reduce the functions of the brain down to an increasingly morbid collection of faculties about which they then bicker and argue about endlessly. Hold up your hands so that your thumbs and forefingers are touching and then hold them out at arm’s length. What do you see? What have you formed? But, is it actually there? Is it not defined by the gap between your hands? Isn’t it really formed of nothing. There isn’t really a triangle there; it is negative space. You haven’t created a triangle. You have bound a negative space in a shape, which from your point of view is similar to, what they told you at school, is a triangle. It is your brain saying that it is triangular. It doesn’t exist other than that. Take your hands away. Where is the triangle now? And yet, your hands still at the ends of your arms? The difference between these two things is the mental back flip you will have to come to terms with in this article. 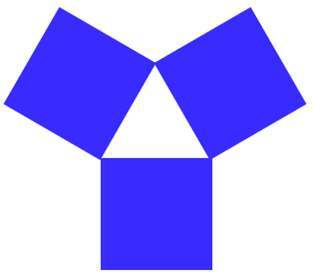 Imagine (or cut out) three blue squares all the same size. Put them on the table. These three objects conform to what, they told you at school, are squares. What shape is there in the middle? You can say to me that it is a triangle. Right? You can work out its length, its height and its width. You can do all sorts of things with it. You can even say exactly how much weight it would support if it were in steel or in concrete. You can also destroy it. In the end, it was only conceptually real. It wasn’t really real. You can talk about it all you want, but it wasn’t really there. You are applying form to it with your brain. You do this to your notion of “self”. Your “self” is not really there. It is the gap in you made by the meeting of all the objects that make up you. One of the most common mental illusions, one that almost everyone falls into, is the identification of the “self”. Most people identify perceived mental states (collected into what we call consciousness) as somehow comprising and illuminating this self. In other words, they believe that they are in control of the consciousness to such an extent that they identify totally with it. Many people, if asked and pressed to identify the self and its consciousness, would say that the consciousness is something in the head, perhaps a few inches behind the eyes, or between the ears. They also think that they are in control of it like a captain in a ship or a driver in a car. The body is the car and the conscious mind is the driver who directs the car into action directly through the will. From this comes the idea that the self resides in the body and yet is separate from it in some manner that is unknown. After the body dies, it goes somewhere else. Where? Who knows, but one thing is for sure: Dead people have no consciousness. It is clear that all the stories, fables and myths of all the cultures are founded on this unmistakable observation and the formulation of potential answers. Usually very complicated ones involving magical kingdoms in the sky or underground. That makes sense. After all, the dead person’s consciousness, their self, sure isn’t around here anymore. Science laughs at this. But science is wrong to do so. It all follows logically. In fact science is doing a pretty bad job of coming up with answers regarding the self and consciousness as well. For these people thinking about this problem is simply a matter of reductionist dogma. Entire tomes and uncounted reams of paper go into arguing whether mental states can be literally counted and consciousness explained in simple terms of reference, as if attaching a term to something somehow enables it to be real. It just appears real. Or at least your “self” appears real. Some people believe that other people are mere ghosts or robots. This is a common form of fantasy entertainment. All of these arguments start too far “up the tree” and not at the root of the situation. The truth is that consciousness identified as the self is not real. Consciousness is an illusion in exactly the same way that the triangle was. But before going any further, I want to speak of this in simple terms with an example of oranges. Should someone throw me an orange then my hand will always rise to catch it. If I deconstruct the chain of events in this circumstance then I come to a startling observation; my (so called) conscious mind has little to do with my effort at all. Most descriptions here would start with the orange being airborne, but let us move a little backwards than that. Firstly, the person throwing the orange will usually warn me that an orange is “incoming”. “Do you want an orange?” they will ask, often brandishing the orange aloft for me to view in their hand. They do this to let me see it, and secondly to enable my brain to start calculating how the affirmative response may be achieved. My brain will have already worked out that the person is likely to throw the orange to me. It does this by instantly remembering everything I know about this person. If it is my brother, then oranges’ will soon be aloft. If it is my wife, well, she will always pass me an orange like a gentlewoman should. All of this memory stuff happens in an instant and then my brain really gets to work and all sorts of new things happen at once. My brain works out if I am hungry and if I like oranges. Many women would say that the male brain ends its decision processing at this point, but in reality that is a crude explanation for the richness of what my brain is doing. It actually performs thousands of calculations in that split second. From how healthy does the orange look, to will I have to wash my hands after and where is the nearest sink? It also considers if you have washed your hands recently? As well as perhaps wondering why am I worrying about cleanliness so much these days? or will this orange be a really juicy one or like that last one I had, which had been sitting around for ages? Where does the brain get all these questions from? The brain is full of memory connections formed from the linking, copying and combination of concepts into memories. Some concepts are stronger than others and the links between them, forged into large enough conceptions, become what we call opinion. The most important aspect of memory is that it appears to us as history and is the way in which the brain perceives the passage of time. Time, of course, is also an illusion but that is another article. Suffice to say that an opinion is a collection of memory connections that has been formed via the perception of history. At a higher level the brain is collecting, mapping and storing memories all the time. Like a stream of information, data, is flowing through the eyes, down the ears and across the skin. This is the endless information of the senses. It flows into the brain in the form of electrical signals, or at least that’s how we can detect its flowing, and the brain sorts it all into different forms. Out of this massive signal, the brain picks out how I feel about oranges (in particular this orange I see in front of me and in pedantry how I feel about you holding this orange that I see in front of me). “Yes please!” I say in return. The orange is hefted aloft and flies through the air towards me. Now the brain is able to go into another mode. Out of all the data coming into it, it is able to single out the orange in flight. It calculates its trajectory in a microsecond. It then orders signals to be sent to various parts of the body. It does this by finely calculating which nerves to pulse and which to switch off. A fascinating and very complicated ballet unfolds as signals bounce around my muscles in my arm and other parts of my body like my shoulders, legs and hips. All of this is amazingly routed through memory again as I am able to avoid objects around me, recount the hundreds of thousands of things I have ever caught, the known weight ranges of oranges, the past grips that have worked well in orange catching situations and even the danger of catching the orange too tightly and thereby ending up covered in orange juice. I catch the orange as though it was easy. In all the millions of calculations that the brain performed; in all the pulses, memories, actions, movements and expressions; I did not “will” any of it. I did not “think” any of it. My body acted on its own to catch the orange and indeed this does shock me, but come to think of it, my brain acted on its own as well. I did not muse through my so called consciousness to make the decision to have the orange; I did not make a logical list and consider the points of orange eating. I certainly did not control my arms directly nor pump blood to my lungs to take a breath. I, me, my “self”, was not involved at all. I did not even will the motion. Many people think that the body is awaiting the consciousness to say “go”. But, actually, all the options, all the thinking and all the doing was outside the will. I was aware of what was happening, but not in control. Not in control? But this is my body! My actions, my mind, my “self”, my will! Which part of your consciousness was involved? None, the brain did it all on its own. And that got me thinking. I started thinking about the other things that this wonder flesh lump between my ears does without my say so. Driving. Fighting. Shooting and running to name but a few. When I drive, sure decisions are made, but does my consciousness make them? My mental perception of the orange event, especially the catching of the orange, was behind that of the brain’s. The sequence of events is difficult to unravel, but when it finally comes out the consciousness only knew after the fact. Why does my body move without my “self” saying? And I don’t mean in simple crude ways, I mean in all ways. Why does my consciousness get in the way when I am driving or fighting or shooting? Why, if I let the brain get on with it, do I perform better? These are important questions because they outline the shape we are building with the blocks that the brain gives us. The shape of me. The sides of the “self”. We know that our consciousness can be affected by many things. Poke us in the brain, punch us in the jaw and fill us full of beer (often this list operates in the opposite direction) and we notice an affect on the consciousness. Take LSD and we notice consciousness expand. Take a class in yoga and we notice it change shape. Clearly it is controlled by the brain. One of the highlights to these questions is the actions of memory. Memory is, as I said, the recording of history in the form of various types of neurokinetic links between bits of the brain. Like a mesh, all connected and yet separate. A matrix of the past. Why do we perceive one thing happens after another? Because the brain is recording it somewhere second by second. It happens so fast that we don’t even notice. Second by second the brain records, assimilates, turns back up the right way and presents. But in which order? If I am not “thinking” of an action makes little difference to whether the brain does it or not. The brain manages to do everything automatically. I perceive that I am still breathing. Still on a train. Still waiting to get home. Waiting is the answer. The brain is clearly aware of time, but the consciousness drifts. Why is this? The clue is in the nature of what Einstein called Spacetime. You see, time and space are not actually separate. They are one. They are indeed different ways of looking at the same thing. The brain is a real thing; it records the “passage of time” correctly. Can’t fool the brain. It knows when you are hungry, when you are tired. What of the consciousness? That can be fooled very easily. Simply make me bored and time drags on and on. Make me excited and time rushes passed like, well like a train. Could it be because the brain is in the real world, and therefore effected by space time, whereas the consciousness is not and can therefore become detached from it? Nevertheless, my consciousness is directly affected by the operation of the brain and not able to act separately from it. The question is does it control the brain? As we have deduced it doesn’t. In fact, it happens to be at the end of the chain when it comes to even knowing about things. But, you say, if I want to pick up a cup, I can do so by my will! Really? We have shown that the brain operates separately from the consciousness. This we knew, what is new is the causal relation between them. The brain runs the conscious, not the other way around. The brain is paying attention to the world around it. You are the brain, the brain is you. The brain controls the picking up of cups and other objects. It is not too much to understand the brain as having much more influence on the decisions that you think. Your consciousness doesn’t try order the brain to pick up the cup, nothing orders the brain at all. The brain is the thinking organ. It hears, thinks, decides, controls and picks up the cup. So what the hell is the consciousness? I am not suggesting that there is nothing in control of your body’s actions, I am just saying that the brain is actually what does it, because you are the brain, you are your body. You are not separate. The consciousness is the memory of the brain’s actions. The brain needs to be able to mesh together the data coming into it to be able to make decisions. It needs, what is in effect, a focused light of sensation. Now there are so many sensations coming into this part of the memory that the brain meshes only some together. The brain does this. This is like spotlight thrown onto a wall of shapes. The spotlight of the consciousness. The point at which the brain joins together the data-streams, so that it may use this data to function, is the consciousness. The conscious is just a function of the brain when writing to memory. We have come to identify ourselves so much with these endless perceptions that we mistake it for the “I”, the soul, or the “self”. There are millions of memories being written all the time, to use a metaphor: millions of perceptions being posted into boxes or millions of waves of data crashing together. The conscious is the foam on those waves. The clashing of signals. And like the output of a TV, it projects a picture. Sure that picture is in full colour, full sound, full experience, but it isn’t in control. The TV does not feed back into the studio and change the program. It is just a projection. This is what Plato was going on about. This is the truth behind David Hume. It is the point being grasped at by Bishop Berkley. The consciousness is not the real “I”. We draw the data together and believe that the mental mashup, the energy of the brain crashing sensations together, is somehow in control. Well, like in the TV metaphor, the brain is the real viewer. It is using the consciousness to make decisions, not the other way around. That is why if you “think” too much you get in the way of being able to act. Because the brain is spending too much energy turning up the fidelity of the signal and not enough processing the effects. That is why you can narrow the focus of your mind. In actual fact the is brain narrowing its focus, your consciousness just experiences it. That is why you get drunk and forget. That is why LSD works. That is why you can experience the world as boring. That is why the so called “self” can be in a mood. The brain is making the sides of the triangle and you are mistaking the sensation of consciousness for the “self”. But, like the triangle, take away the walls; take away the brains signals, and consciousness cannot form. That is why “you” die. That is why how you see yourself is different from how others see you. That is why you dream. That is why you feel love. That is why you consider yourself alive and that is what we identify as living. Having a consciousness is an illusion of having a separate “self”. In actual fact the brain is the sum total of you. It is in control of your mind, not the other way around. This is why sometimes answers, “Just come to you”. They are not coming out of thin air, the brain – you – has worked them out, but not shown the consciousness. Enjoy it. Enjoy the knowledge that “you” are surfing on the shoulders of one of the galaxies’ true wonders. It will look after you, this little fleshy lump is you after all. You are it. You are wonderful, little brain. I love experiencing your actions; I thank you for being me and for showing me myself. I promise to take care of us both and together we can go out and experience the entire universe. So, having come to this conclusion, what does that mean for the science of the mind? It makes no sense to talk about consciousness as separate from the brain. The conscious states are an output signal, the brain makes decisions based on them, but those decisions are all, entirely, what is called sub-conscious. The illusion of decision making by the conscious arises from the passage of time and historical memory. The brain makes all decisions and the consciousness is not involved. The brain does all the thinking, including the thinking about the brain thinking. It is more than capable of being self-referential. So it makes no sense to talk about consciousness in any way that suggests control. Or of decision making and of it being the “self”, soul or “you”. That is the worst type of illusion. The brain is in charge. The brain is capable of processing everything we ascribe to the consciousness, which only acts as an output signal matrix of sensations clashing together. Our over-identification with this sensation matrix as the self is holding science back.